Looking after the water in your pool can feel like an intimidating job, but it doesn’t have to be. While there is a bit of a learning curve you’ll find that if you follow certain procedures on a regular basis it will soon become a piece of cake. Check out the instructions in this handy blog post and you’ll be on your way to enjoying your swimming pool experience. Circulation: Every pool has a pump that circulates water through the filter system and back to the pool. The more your water is in motion, the less chance bacteria and algae have to take hold and grow. For best results, let your main pool pump run 24 hours a day/7 days a week. The pump should never run less than 12 hours per day. Filtration: The filter is one of your most important pieces of pool equipment. It removes both visible debris and microscopic matter. Cleaning: Most swimming pools have areas with little or no circulation (such as corners and steps). This is where algae and bacteria can start to grow. It is important to brush the walls and floor at least once a week to keep the entire pool clean. If you do not have an automatic cleaner, vacuum with your manual vacuum at least once a week to remove debris. Testing: Every pool has characteristics that must be measured and adjusted. This includes Free Chlorine, Total Chlorine, pH, Alkalinity, and Calcium Hardness. Use a test strip at least once a week to monitor these readings in your pool, and adjust them accordingly. We will go into that more later. Water Care: The last step in a pool maintenance program is to apply the right products to your water to keep it crystal clear. Adding chemicals also helps to provide a safe and sanitary swimming environment, and protect the pool surface and equipment from damage. This post will focus on Key 4 and 5 even though it takes all 5 Keys to make the pool water the dazzling water you love to enjoy so much. Your pool water should be tested with a test kit or strips for free chlorine, total chlorine, pH, and total alkalinity at least once a week. Aquachek Pro 5-Way Test Strips is the easiest way to test. There are no liquid drops to add, and the color chart is easy to use. When testing with strips, take one strip out of the bottle, and screw the lid back onto the bottle. (This eliminates the chance of leaning over the pool with the bottle in your hand and dumping all 50 strips in the pool). Dip the strip a minimum of 12” into the water, away from the jet returns, and immediately bring strip back out of the water and match the colors on the strip to colors on the back of the bottle. 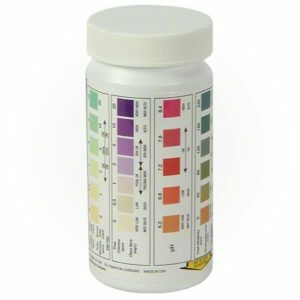 Adjust pH and total alkalinity if necessary, per directions in the chemical section. If chlorine is reading 5ppm or higher no shock treatment needs to be added for that week. Measures good chlorine in pool water that is available to kill bacteria. This is the kind of chlorine you want to have. Measures all chlorine in the water, whether working or not. Ideally, this will equal free chlorine level so that all chlorine in the pool is free and available. Is calculated by subtracting the # of ppm of Free Chlorine from # of ppm of Total Chlorine. If combined chlorine level is high, then shocking the pool water is required. Combined Chlorine or chloramines is what gives the pool the strong chlorine smell. Measures the comfort factor of the pool water for swimmers. Water in this range is comfortable to skin and eyes (eyes have a pH of 7.3). If pH is low, water is acidic and can cause corrosion in pool equipment, as well as red, itchy eyes. If pH is high, water is basic and can cause scale to form and irritation to your skin. Measures pH resistance to change. If TA is low, pH will usually follow. Same with high TA. Always adjust total alkalinity first if necessary, before adjusting pH level. If testing with a drop kit, make sure you test for free chlorine level. Refer to the instructions on your kit to see whether your test is for free or total chlorine. Bring in a 500mL water sample for a free computerized analysis at least once a month during the summer season so we can measure Calcium Hardness, Stabilizer, and Phosphate levels. If you have a solar blanket, make sure you take it off the pool every 2 – 3 days so the pool can breathe. There are many other chemicals that are used in special situations. For example algae killers, clarifiers and stain & scale cleansers. Come see us to check whether they are needed and for the instructions. Step 1: Add Dazzle Ultra Cleanse weekly to the skimmer while pump is running. It provides protection against the risk of algae by removing phosphates. This is a healthier, more natural way to prevent algae in your pool. Dosage is 40mL per 10,000L of pool water. Step 2: Add Dazzle Amaze Plus weekly by broadcasting the powder over the water surface. It detoxifies and clarifies your water by removing non-filterable wastes and restores the pool to nice, sparkling water. 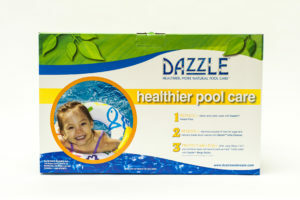 One pouch (350gr) of Dazzle Amaze Plus can take care of 40,000L of pool water. Step 3: Add Dazzle Mega Sticks to your skimmer basket. Usually you’ll go through about 2 sticks weekly but that all depends on chlorine demand. These chlorine sticks control bacteria growth in your swimming pool water. For additional answers to frequently asked questions, check out our Pool Water Care FAQ page. If you have questions or would like more information, please call our Water Care Technicians at 403-327-7665, or come see us at 1252 – 3 Ave S, Lethbridge. 5 days 13 hours ago.